Mysuru: Disheartened by the sudden falling prices for their crops, hundreds of irate farmers staged a protest this morning in front of Agricultural Produce Marketing Committee (APMC) office at APMC premises in Bandipalya here. They threw truckloads of vegetables including tomatoes, cucumber, cauliflower and brinjal on the road to register their protest. They even distributed vegetables for free. 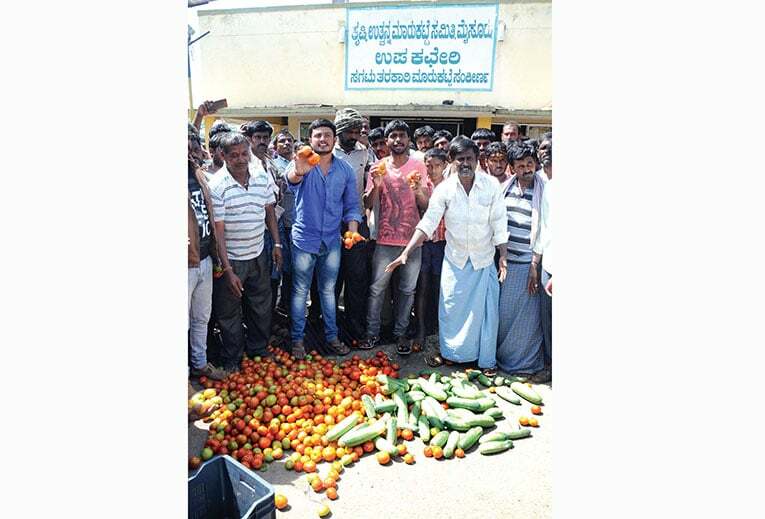 Apart from local farmers, vegetable growers from neighbouring districts of Mandya, Chamarajanagar, Hassan and Tumakuru and farmers from neighbouring Tamil Nadu had brought huge loads of vegetables to the APMC market this morning and this led to glut in the market and prices collapsed. Angry farmers told SOM that APMC wholesale traders and commission agents (middlemen) had offered a paltry 50 paise to Rs.1.50 per kg for wholesale tomatoes and Rs.3 per kg for other vegetables. “The middlemen, in collusion with traders, have conspired against us. The price offered by them is not even sufficient to meet transportation costs,” they alleged. Farmers said, prices of all vegetables which stood at about Rs.10 per kg two to three days back, has reduced to Rs.2 to Rs.3 at the APMC market today. As wholesale buyers and middlemen refused to buy the produce from local farmers, a protest was staged. As a result, heaps of tomato, green chilli, cauliflower, brinjal, cucumber, ladies finger and beans remained unsold at the APMC yard. The worst hit items were tomato, cucumber, ash gourd, brinjal and cauliflower which had literally flooded the market. Farmers shouted slogans against APMC President and Vice-President for not visiting the spot to redress their problems. The farmers demanded to stop the role of middlemen besides fixing decent prices for their products. They threatened to continue their protest until their demands are met. Initially, they distributed vegetables to pedestrians for free in the morning. They dumped their entire stock of tomato and other vegetables on the roads and shouted slogans against the government for its failure to stabilise vegetable prices. The farmers insisted that the district administration should intervene and initiate steps to prevent the arrival of vegetables from outside. This is the state of our farmers, they grow food for India. Elected representatives are busy with Statues , politics, and all things trifle. Backbone of India the Farmers are Suffering and no one to heed to their Voice.